Let your music take precedence with Jarre Technologies fierce and fascinating AeroBull HD Bluetooth Wireless Speaker. 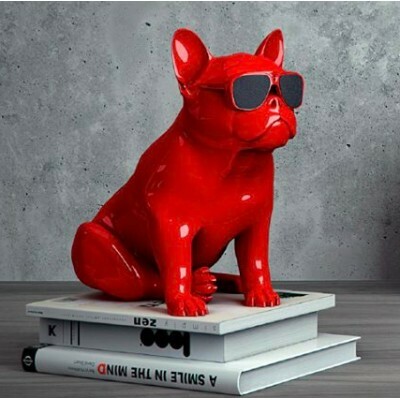 The stylish AeroBull HD is man’s best friend, providing the high definition sound that comes from Jarre Technologies commitment to innovation and research. As masterful as its namesake, the AeroBull HD is an easily and rapidly synchronized speaker for the stylish consumer. Available in 3 vibrant colors: white, red and matt black; the AeroBull HD is designed as a graphic and surprising statement piece that combines wit and function. Blasting out crystalline aerial sound with deep bass through a sophisticated 2.1 system, the AeroBull HD is a 120-Watts beast when it comes to making music. Connect the AeroBull HD to any smartphone through Lightning dock, Bluetooth (aptX) or use the 3.5 mm Line-in to any audio source in your media suite. 67 x 43.5 x 64.1 (H x W x D) in cm.